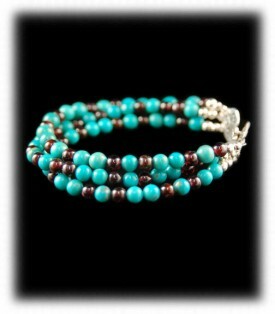 Shop for Turquoise Bead Bracelets - Now! 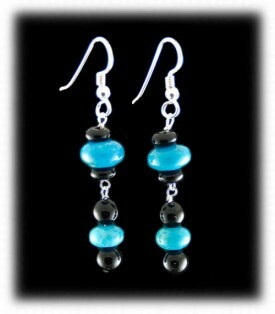 Shop for Turquoise Bead Earrings - Now! 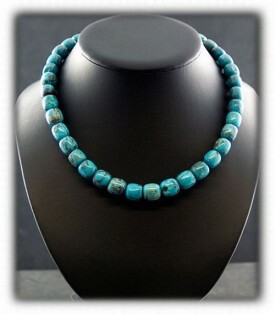 Shop for Turquoise Bead Necklaces - Now! Turquoise Bead Jewelry by Durango Silver Company is handcrafted with the finest quality genuine Turquoise Beads as well as a variety of gem quality Coral, Lapis, Sugilite, Gaspeite, Spiny Oyster, White Turquoise, Tibetan Yellow Turquoise, Onyx and a variety of other high quality hand picked Gemstones. We believe we make Turquoise Bead Jewelry that is superior to most others that you may find in most Internet Stores, Fashion Jewelry Stores, Niche Galleries or Boutique Shops. We do not claim or want to be the cheapest, we claim to be among the best Turquoise Bead Jewelry producers in the Southwest! We have been first class Jewelers in the Southwest for nearly forty years and we have marketed our Southwestern Jewelry directly to the public in our world renowned Trading Post located in Durango Colorado since 1976. We have collected high quality American Turquoise for over forty years and we have been mining Turquoise and cutting our own stones for about the same. It is a continuing goal of ours to produce Turquoise Bead Jewelry that we are proud of and are confident when we offer it to our special clients. We have a very special person here named "Nattarika" who heads our Turquoise Beaded Jewelry department. Nattarika has a college degree in Fine Arts from the Chiang Mai, Thailand College. She is brilliant and has the eye! John and Dillon Hartman have been gemstone buyers and cutters for many years and assist Nattarika in hand selecting Turquoise and other Gemstone Beads that we proudly assemble into works of art. Whether she is making Beaded Turquoise Necklaces, bead earrings or bead bracelets, all of Nattarika's bead jewelry is spectacular! We invite you to explore our Online Store to find a great selection of high quality Turquoise Bead Jewelry as well as other great Southwest Jewelry items that we are proud to offer. We hope you will agree, Durango Silver Company cares greatly about what we offer our customers. Here are two beautiful Turquoise Bead Necklaces made by Nattarika Hartman of Durango Silver Company. 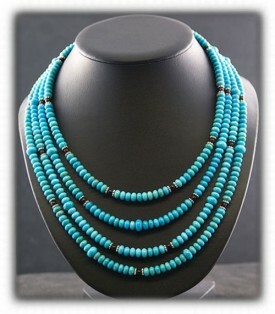 Authentic Turquoise is alway of the greatest importance to Nattarika as she is from Thailand and a Buddhist. Nattarika believes authentic Turquoise has metaphysical powers and the Turquoise Bead Necklaces that she makes are more than just another piece of Jewelry. A Turquoise Bead Necklace by Nattarika is a beautiful piece of art as well as a spiritual necklace with the spiritual powers of Turquoise. Here are two pair of Turquoise Beaded Earrings made by Nattarika. 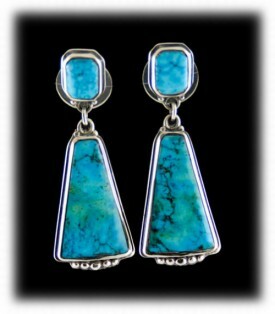 They are both made with Sleeping Beauty Turquoise from Arizona with Sterling Silver findings. The Turquoise Bead Earrings on the right have Black Onyx and Turquoise together which is very attractive when worn. You can also view our Turquoise Bead Earrings Page to see more Turquoise Bead Earring designs by Nattarika and Durango Silver Co. 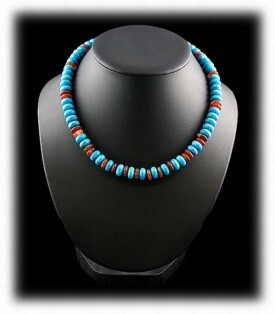 The Turquoise Choker Beads on the left were made with rondell shaped Turquoise Beads and accented by Carnelian Beads. The green Turquoise Bead Necklace on the right was made with green Turquoise disc beads. 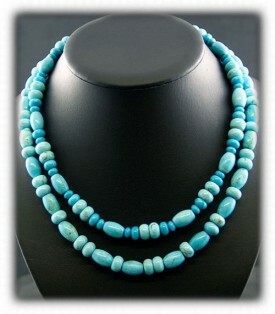 There are many shapes of Turquoise Beads which allows for hundreds of different Beaded Necklace designs. Turquoise disc beads can be mixed with many other shapes and gemstone types of beads to create beautiful Necklace combinations and sets. Here is another example of different shaped Turquoise Beads and how they can create unique and unusual Turquoise Bead Jewelry. The Beaded Necklace on the left was made with domed barrel Turquoise Beads mixed with small Turquoise Rondel Beads that are slightly darker. This combination makes for really good looking Turquoise Bead Jewelry. The two strand Turquoise Necklace on the right has multiple sizes of Turquoise beads and is accented with Black Onyx Beads. 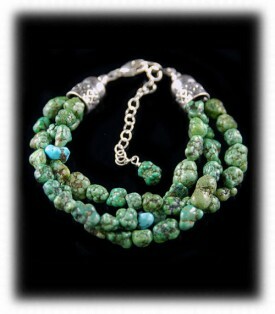 Notice this Necklace has a chunky Turquoise appearance. 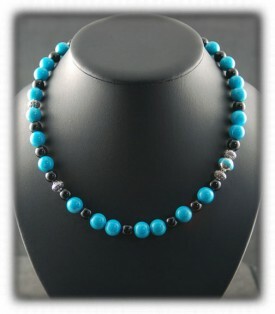 See additional Fashion Turquoise Bead Necklaces. Here are two different Turquoise Bead Cuff Bracelets made by Nattarika. The Turquoise Bead Bracelet on the left was made with Kingman Turquoise Rondel Beads and the three strand chunky Turquoise Bead Bracelet on the right was made with green Turquoise from Nevada. Nattarika likes to make all types of Turquoise bead braclets, she especially likes to make fashion style Turquoise Beaded Bracelets. 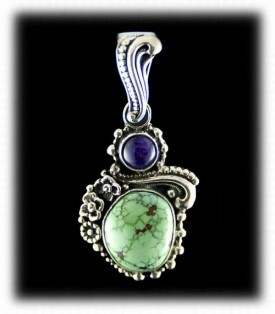 To the above left is a beautiful Tortoise Turquoise Bead Necklace with a handcrafted Sterling Silver with inlaid Sugilite Bead. This necklace set has three strands of beads and is 20" long. On the right is a Royston Turquoise Disk Bead Necklace, Royston Turquoise Beads are unique and not often for sale. 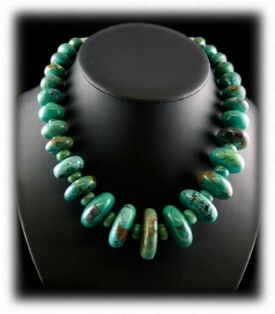 Durango Silver Co gets Royston Turquoise Beads from time to time, check our site often for special beads. 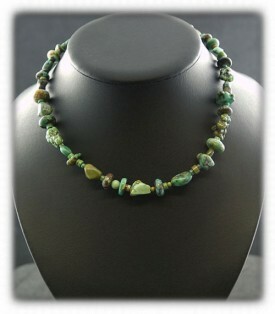 For more information and Turquoise Bead Necklace examples - Check out this Turquoise Bead presentation page. 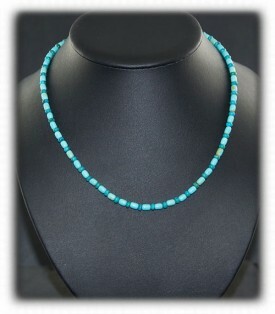 Turquoise Beads vary greatly! There are Turquoise Beads that are made for the commercial marketplace that are made to sell as cheap as possible and then there are Turquoise Beads that are made from high quality authentic Turquoise that are beautiful and even metaphysical to people in the Know. Turquoise and Turquoise Beads are some of the very first Gemstones known to man, (5,500 BC - Cairo Museum,) they have been owned and worn by Medicine Men, Spiritual Leaders, Kings, Pharaohs and people that have had good health, happiness and fortune. Modern American Beadwork includes making different types of Turquoise Beaded Jewelry and Durango Silver Company produces Turquoise Bead Earrings, Turquoise Bead Bracelets, Turquoise Bead Pendants and Turquoise Bead Necklaces. All of our American Beadwork is made with hand selected Turquoise, including Turquoise Nugget, Turquoise Nugget Beads and Sleeping Beauty Turquoise as well as other Gemstone Beads. One of the most valuable visions we have here at Durango Silver Company is that we create more than Southwest Jewelry with the Turquoise Beads we use in our pieces. 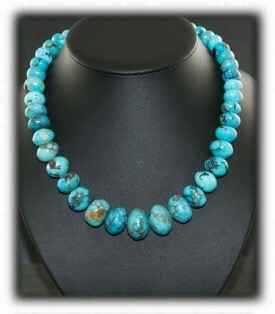 We use quality authentic Turquoise Beads that will become part of the lives of the people that purchase them from us. We know that most of the Turquoise Jewelry and Turquoise Beads we sell will have a spiritual attachment to our clients and we love it! We also have Antique American Indian Beadwork of the Plains Indians such as Beaded Moccasins, Bags, Vests and etc. We specialize in high quality authentic American Turquoise Beads as well as natural Turquoise Beads from around the world. We appreciate Antique Turquoise Beads from native peoples of the Southwestern United States, Tibet, Persia and the far corners of the world. If you are interested in acquiring "Real Turquoise Beads", shop at Durango Silver Company. We hope you have enjoyed our presentation and have gained some useful knowledge from it. We invite you to learn more about Turquoise and Turquoise Bead Jewelry by following the links in our Learning Center to other informational pages that we have written on different topics related to Turquoise Jewelry. In addition, we would like to invite you to join our E-Mail Newsletter - about once every other month we send out a Newsletter to inform our members of what's happening with Durango Silver Company, new products, specials for our members and more. We also have a monthly drawing from our member base to give away free Turquoise Jewelry from our company. Please take a moment to become one of our friends by signing in below. Thank you for reading about Turquoise Bead Jewelry.